When I'm spending money on products, I want to see results. I want to get the cleaning/conditioning job done, while seeking gentle anti-aging benefits overall. I look for items that I can start and stop using at any moment, without having my skin freak out. Clarins is a brand that has been around for a long time, backed by thorough research and positive results. I've always connected with Clarins, like a big sister who looks polished and professional no matter what. I admire their fresh and youthful models, and how classy a Clarins routine can be. In the early days of blogging, 8-odd years ago, I would collect beauty books by the truckload from the Toronto Public Library. Between Paula Begoun's "Don't go to the Cosmetics Counter Without Me" (they're on edition #9) and "The Beauty Bible", I've made my way down the list of historic beauty game-changers. 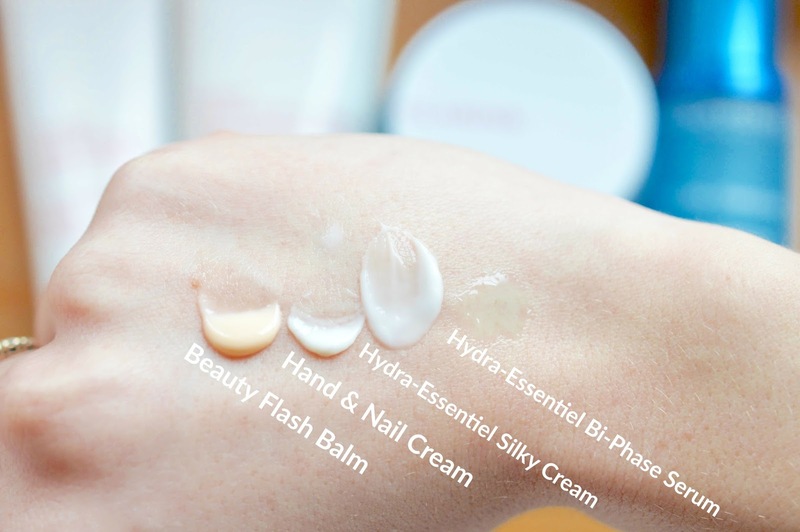 I've tested the likes of Elizabeth Arden's 8-Hour Cream, Embryolisse Lait-Crème Concentré, and Philosophy's Purity Cleanser, but The Beauty Flash Balm is one that really stuck. If you deal with dry, flaky skin (hello, everyone in the winter) you need this. I first purchased the Beauty Flash Balm in 2011 at Winners. The price tag did hold me back from repurchasing, though I really should have sooner. Most loved as a plumping makeup primer, the Beauty Flash Balm transforms my skin. All you have to do is spread a pea-sized amount on your freshly cleansed face - I apply this after my Thayer's Alcohol-Free Witch Hazel toner - then apply foundation immediately after. Don't let the product dry! This is the magic step that will adhere the foundation or concealer to your skin and keep it looking fresh and dewy all day. Flakes, be gone. The Hydra-Essentiel range contains Clarins’ anti-pollution complex to protect the skin against the harmful effects of indoor and outdoor pollution. Our treatments help protect the skin against the harmful effects of pollution. Skin appears younger and its radiance is revealed immediately. 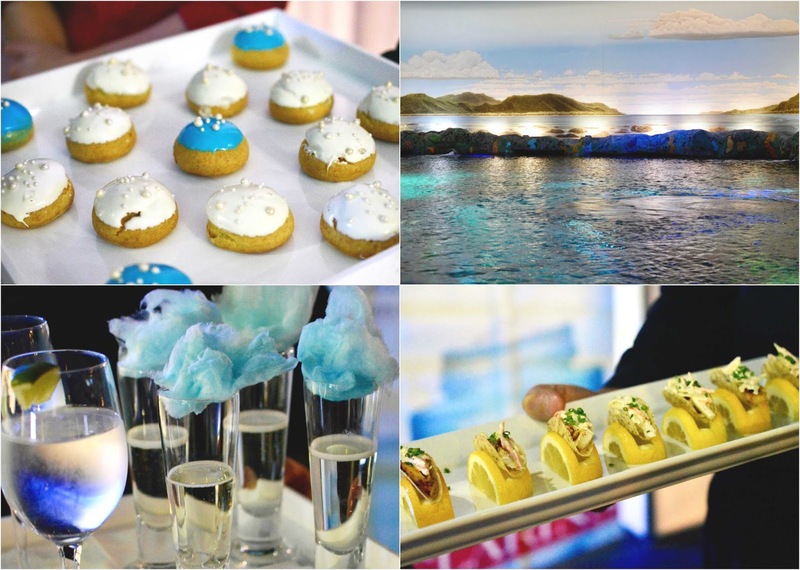 Earlier in January I attended one of the most creative events hosted by the lovable Clarins team at Ripley's Aquarium in Toronto. While sipping on cotton candy Prosecco by the shark tank (photos below) we learned about the impact of thermal shocks on our skin's hydration levels. My skin is extra temperamental in the winter. From sudden daily changes in temperature and humidity, our skin’s natural water retention systems are altered. I was so excited to visit the Aquarium, especially since I had no idea what Hydra-Essentiel was all about. And now, it all makes sense. This serum feels like water, and is suitable for all skin types. Shake it up, then apply one pump all over the skin after cleansing and toning. As light as it is comfortable, this intensely hydrating bi-phase serum quenches irritated, dull, and uneven skin. Its secret? Organic leaf of life extract, a powerful natural hydration activator that boosts the skin’s hyaluronic acid production. This "sponge molecule" holds more water in our epidermis for optimal plumpness and a smooth, glowing complexion. If I'm not using my Beauty Flash Balm, I'll wear this serum under my makeup - again, in place of moisturizer. I'm left with no dry patches at all, and this Hydra-Essentiel routine has eradicated the stubborn dry skin around my nose and chin all together. Score. Labelled "Thirsty skin's BFF", this nighttime moisturizer pairs perfectly with the Bi-Phase Serum. It reminds me of Clinique Moisture Surge, but with a less waxy texture. Again, fresh and water-like, this collection is packed with leaf-of-life extract which feels almost juicy and jelly on the skin. I prefer tubes to jars of cream, since continuously dipping in fingers can be a bit unhygienic and the product will go bad quicker. That being said, jars makes it very easy to use up skincare to the very bottom - and you can always see how much is left. This hand cream is very effective, packed with Aloe & Shea. It has a lovely warm scent and a good texture that isn't greasy. A nice change from my go-to L'Occitane Shea cream, which can become a bit repetitive and doesn't always dispense out of the metal tube easily. Though I don't use hand cream as religiously as I should, reviews state that this cream fades age spots and strengthens nails. This is the perfect elevated micellar water that I use after my cleansing oil if I'm not in the mood to get out a brush and foaming wash. It removes traces of mascara and foundation, while leaving my skin feeling comfortable. I never need to wash off any residue from this water, as I'm confident that my skin and eyes are cleaned of dirt and bacteria so I can apply serums and moisturizers without worry. The vanilla peach scent is delicious, in my opinion, and never leaves my sensitive skin irritated. Keep scrolling to see some snaps from the event! Cream puffs, fish tacos (fitting?) and delicious cotton candy Prosecco. Catering by Daniel et Daniel - c'était délicieuse ! 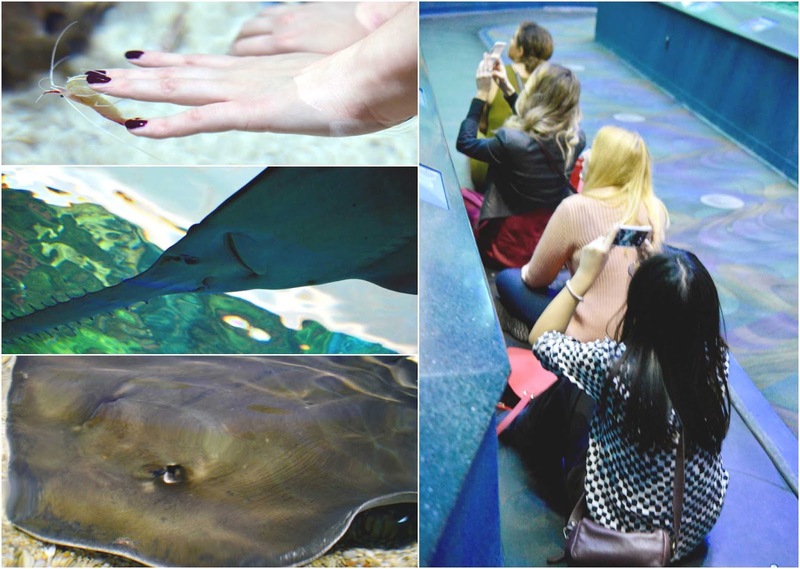 It was so fun exploring the Aquarium with my CBB friends, while freshening up our skincare routine thanks to Clarins. 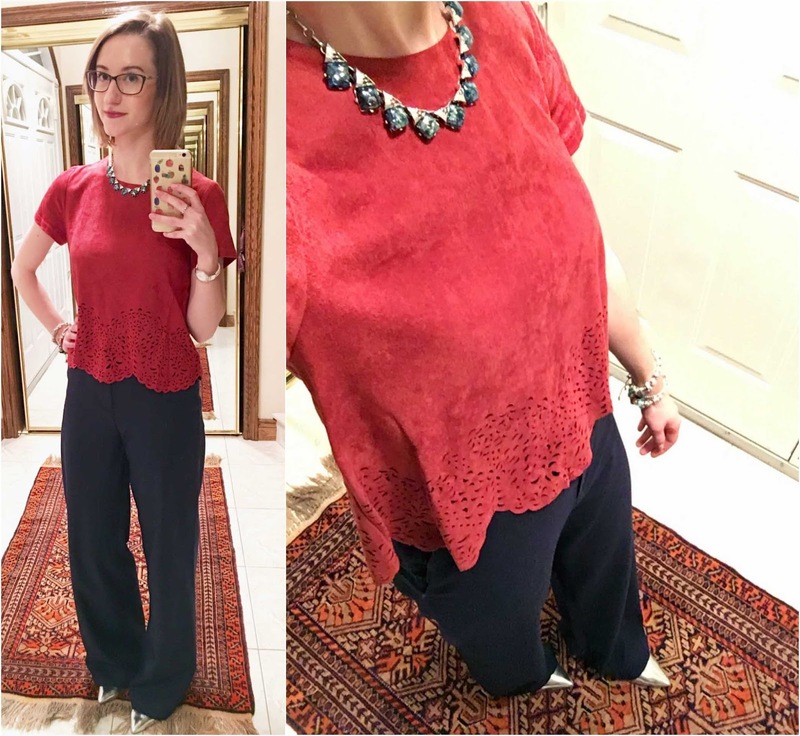 My outfit played up on the coral, and deep-sea theme with a vintage necklace, wide-leg trousers and some statement shoes to tie it all together. Clarins is not a new brand in my collection, recently mentioned in a "Best of Clarins" post here. Since then I've tried their eyeshadow and mascara, and I'm eying their new contour palette and revolutionary 4-colour pen. Do you have any Clarins favourites?